I'm back in the healthy meal days, yaaaay! Its been months since I don't follow my healthy routine (exercise and clean eating), its because my blood pressure is very low so I thought I shouldn't limit what I eat. But then that leads to some weight gain heheh I consider my self so fat right now, I never been this heavy hahaha. So yesterday I went grocery shopping to Superindo because its near to my house. Superindo is where I usually buy my muesli, because they have this one kilogram pack of muesli, imported from Belgium with a very affordable price... Rp 45k! That's really cheap compare to other muesli products. The others are usually more expensive, like Rp 80k for 800gr of muesli. So Superindo's muesli is quite a nice bargain, huh? Anywaaaayy, I posted my overnight muesli on my Instagram and surprisingly lots of my followers are asking about it. So here I'd like to share you how to make a cinnamon overnight muesli! 3tbs of original muesli, no sugar added. Don't buy the flavored muesli you see in the supermarket, because they've added some sugar and sure the calories are higher. Pick the original muesli, mine came with dried raisin and almond. Mix the muesli and cinnamon powder in the jar. Pour some milk and make sure that it soaks in the muesli, the ratio is around 50:50. Add some honey if needed. My muesli is mixed with raisin so I didn't use honey because the raisin is sweet enough for me. Mix the muesli and make sure that everything goes everywhere in the jar. 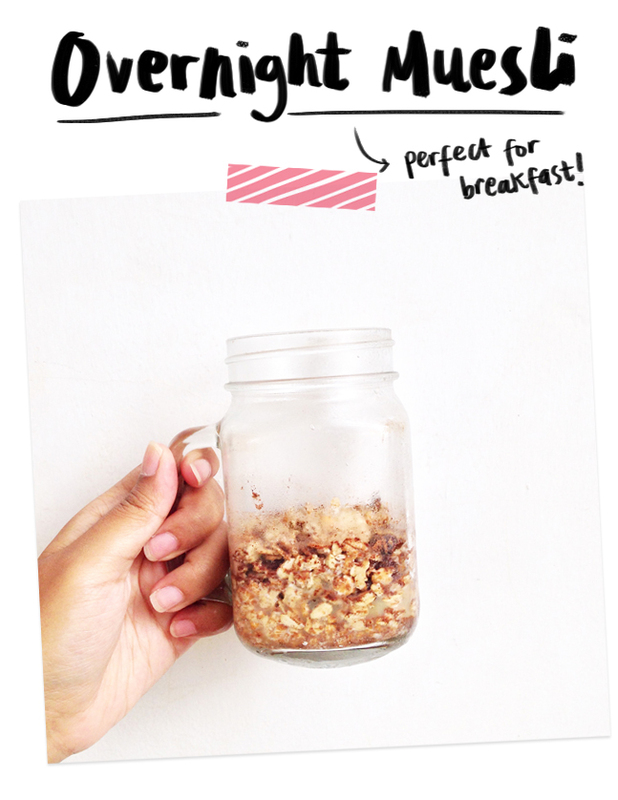 I love to add fresh fruits or corn flakes for some crunch in the jar, just before I eat it. I don't really like to have the fruits being soaked too long.